The long-awaited new novel from the award-winning author of THE GRASS SISTER tells the story of two generations of the Nancarrow family and the high-jumping horse circuit prior to the Second World War. A love story of impossible beauty and sadness, it is also a chronicle of dreams ‘turned inside out’, and miracles that never last, framed against a world both tender and unspeakably hard. Set in hardscrabble farming country and around the country show high-jumping circuit that prevailed in rural New South Wales prior to the Second World War, FOAL’S BREAD tells the story of two generations of the Nancarrow family and their fortunes as dictated by the vicissitudes of the land. It is a love story of impossible beauty and sadness, a chronicle of dreams ‘turned inside out’, and miracles that never last, framed against a world both tender and unspeakably hard. Written in luminous prose and with an aching affinity for the landscape the book describes, FOAL’S BREAD is the work of a born writer at the height of her considerable powers. It is a stunning work of remarkable originality and power, one that confirms Gillian Mears’ reputation as one of our most exciting and acclaimed writers. Readers thought Foal’s Bread symbolised hope and triumph and the foal born would bring good fortune and be a champion. It can be considered a bleak book from the ugly side of life, to the miracles – but it catches one’s very soul, covers all our emotions and keeps the reader interested in the past and tough human lives in a harsh environment which is what country life is. 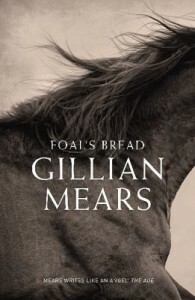 Although Foal’s Bread is not the type of book I normally read, it kept be intrigued never the less. This entry was posted in Australian Authors, Awards & Prize Lists, Fiction, Historical Fiction, Recommended Reading and tagged Book Club, book review, books, Parramatta City Library, reading by admin. Bookmark the permalink.